NFL players seem to have run out of creative ways to celebrate. Either that, or they’ve decided to pay homage to the players they grew up watching, even if it costs them some funds for injecting fun into the game. 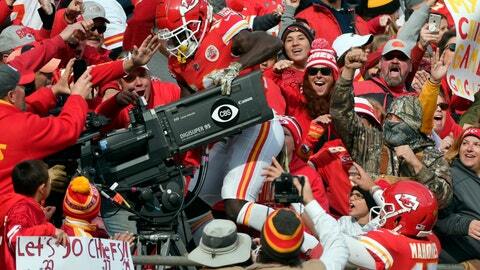 Chiefs receiver Tyreek Hill was the latest to go old school when he commemorated his second touchdown in Week 10 by commandeering the CBS camera like Cincinnati’s Chad Ochocinco once did. “The celebration just came into my head,” said Hill, whose actions netted an unsportsmanlike conduct penalty and a coach Andy Reid’s ire. “That was too much,” Reid said. The NFL, which has relaxed celebration rules, might agree. Hill’s stunt came days after Saints receiver Michael Thomas was fined $30,000 for using a phone as a prop, a la Joe Horn, and Titans safety Kevin Byard was dinged $10,026 for celebrating an end zone interception on the Cowboys‘ midfield star logo, just like Terrell Owens did in 2000. Saints tight end Ben Watson added a little twist to his celebration when he stuffed the football under his jersey to signal his wife’s pregnancy just like … Ben Watson did, back in 2009. When Watson, 37, scored against the Rams last Sunday, he let the world know he and his wife, Kristen, are expecting twins by stuffing the ball under the front of his jersey and holding up five fingers on one hand as he often does to honor his five children. Then he held up two more fingers on his other hand in honor of the twins on the way. Nine years ago, Watson similarly stuffed the ball under his jersey after scoring as Kristen was close to full term with their first child, Grace. He was fined shortly thereafter for using the ball as a prop. Hill was flagged for unsportsmanlike conduct in Kansas City for taking over the TV camera, just as Thomas was for pulling a flip phone out from under the goal post padding after his fourth-quarter score against L.A.
No pun intended, of course. Byard said Friday his $10,026 fine was worth it because his interception denied the Cowboys a touchdown and sparked a 28-7 run in Tennessee’s 28-14 win in Dallas on Monday night. Byard said he expected the Cowboys to take offense when he sprinted to the 50-yard line to pose on the star, then began a sort of Irish jig when teammates joined him at midfield. Cowboys running back Byron Jones quickly shoved Byard away, playing the part of George Teague, who blasted Owens when he did the same thing while with the 49ers 18 years ago. “You don’t do that,” Jones said. Byard met with his coach, Mike Vrabel, who had a big problem with his DB’s actions. Vrabel said he wants players to celebrate with each other and not stand up an opponent. “It’s not what we want to do,” Vrabel said. Byard said his over-the-top celebrations are history. Other takeaways from Week 10 included a stumbling, bumbling Tom Brady, a shoutout from the Rams to Halle Berry and Sean McVay’s decision to train at altitude in preparation for Monday night’s showdown between the Rams and Chiefs, who are both 9-1. ALTITUDE ACCLIMATION: Last year, Bill Belichick decided to stay in Colorado after a win at Denver to acclimate to the altitude of Mexico City’s Azteca Stadium (elevation 7,200 feet) by practicing at the Air Force Academy (6,621 feet). It paid off in a 31-8 drubbing of the Oakland Raiders, who stayed home and prepped at sea level. McVay said the trade-off is scrubbing the team’s routine, but the wildfires and mass shooting in Thousand Oaks has made training in Southern California anything but normal anyway. The Rams will train in the Rocky Mountains on Thursday through Saturday before flying to Mexico, and McVay said a second charter with family members will fly out from L.A. to Colorado later in the week. HAIL HALLE : Jarod Goff was glad it was quiet enough for fans to hear his “Halle Berry” play call Sunday. Even the actress heard it, tweeting him for an explanation. Goff couldn’t reveal secrets of the audible, which resulted in an 8-yard pass to tight end Tyler Higbee. BRADY’S BUNGLE : A lot is made of Brady’s arm at age 41 and how he was just 21 of 41 Sunday in a 34-10 loss at Tennessee, where he was held without a TD pass for the second time in three weeks. But what about his stumble and tumble on a trick play in which he caught the pass only to trip over himself and plop down a yard short of the first-down marker? Tennessee QB Marcus Mariota later caught a pass on the Titans’ own trick play. “I wanted to see if ours looked any better than theirs,” deadpanned Vrabel.